This is a pair of mid century modern side end table nightstands by Heywood Wakefield. They have their signature curved design, 1 dovetailed drawer, 2 tiers with a top shelf and bottom shelf, in wheat finish. Dimensions: 19.5″W x 17″D x 26″H. These are 3 pairs of mid century modern table lamps. The first is a pair of pottery lamps by Haeger in a pretty chartreuse. The second is a pair of pottery lamps in a pop of turquoise. The third is a pair of spiralling white pottery lamps with brass bases. All 3 pairs of lamps are sold. This is a pair of mid century modern chairs with a solid wood frame, and newly upholstered seats in its original tufted poppy naugahyde. Dimensions: 21.5″ seat width, 19″ seat depth, 18.5″seat height, 32″ back height. This is a mid century modern tall dresser and matching pair of nightstands by Unagusta. The tall dresser has a top cabinet with a foldout secretary and 3 small accessory drawers and cubbies. The bottom has 4 dovetailed drawers with sculpted brass drawer pulls, and brass tipped legs: 40″W x 20″D x 46.5″H. The pair of nightstands also has 3 dovetailed drawers with the same brass tipped legs: 22″W x 16″D x 26″H. Both the dresser and pair of nightstands are sold. This is a mid century modern pair of side end table nightstands by American by Martinsville. The 2 dovetailed drawers have a beautiful parquet design on front, with sculpted tapered legs. Dimensions: 23″W x 16″D x 21″H. This is a pair of mid century modern side end table nightstands that has 2 dovetailed drawers with a concave design and brass pulls, and tapered brass accented legs: 22.5″W x 18″D x 26″H. 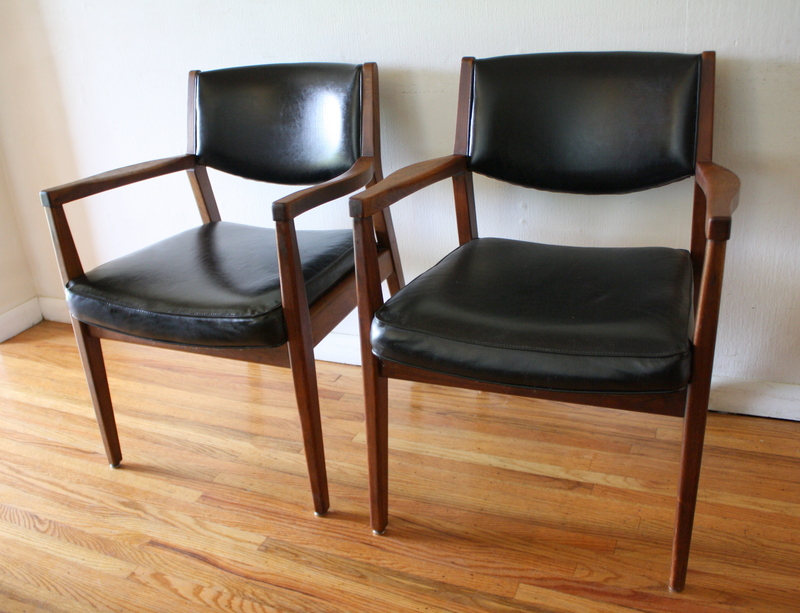 This is a pair of mid century modern arm chairs by Gunlocke. They have solid wood frames that have been newly upholstered with black naugahyde cushioned backs. Dimensions: 19″ seat width, 18″ seat depth, 17.5″ seat height, 30″ back height. This is a pair of mid century modern teak side end table nightstands. They have an asymmetrical cutout design on top, a mini writing desk shelf pull out, and 2 drawers each with a streamlined design. Dimensions: 20.5″W x 17″D x 30″H. 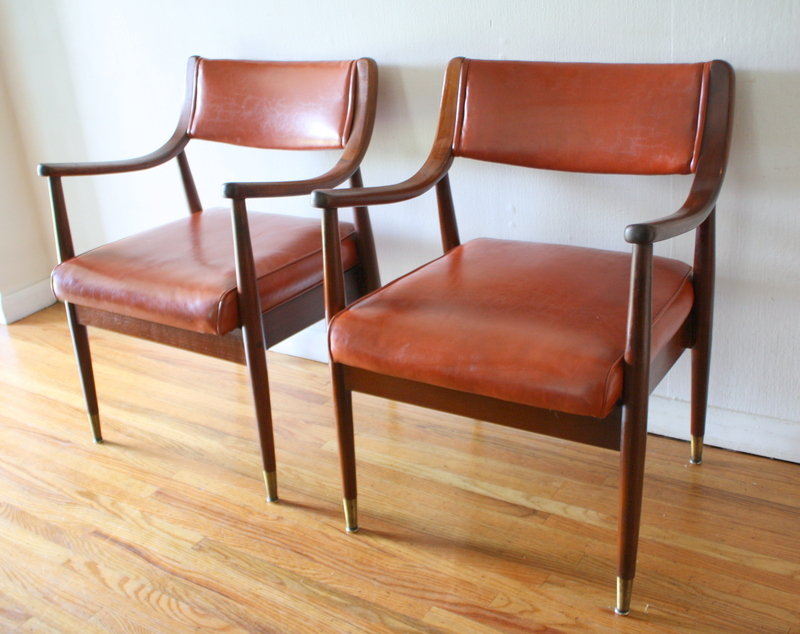 This is a pair of mid century modern chairs with beautiful solid wood frames with curved backs and tapered legs. The seats have been newly upholstered with black naugahyde. Dimensions: 19.5″ seat width, 17″ seat depth, 17″ seat height, 30″ back height. This is a pair of mid century modern chairs by the Boling Chair company. Each chair has an upholstered seat in black naugahyde, and the frame has a beautiful curved back and arms with brass tipped tapered legs: 20″ seat width, 20.5″ seat depth, 18″ seat height, 30″ back height. This is a pair of mid century modern chairs that has solid wood frames, and have been newly upholstered with a turquoise and white chevron on seats. This is a pair of mid century modern side end table nightstands. Each one has 1 dovetailed drawer with a brass pull, and a rattan bottom shelf: 24″W x 16″D x 21″H. This is a pair of mid century modern chairs with sculpted solid wood frames, beautiful rattan backs, and upholstered seats in new teal tweed. Dimensions: seat width: 19.5″, seat depth: 17″, seat height: 18.5″, back height: 31″. These are 2 pairs of mid century modern arm chairs with solid wood frames and upholstered naugahyde seats and backs. Dimensions of black chairs: seat width: 19″, seat depth: 20″, seat height: 17.5″, back height: 31.5″ . Dimensions of orange chairs: seat width: 19″, seat depth: 20″, seat height: 17.5″, back height: 30.5″ . Both pairs of mid century modern chairs are sold.